This book of hours is illuminated in a style combining features typical of a group of manuscripts made in Suffolk, probably Bury St. Edmunds. Heraldry in one of the initials indicates that the manuscript was made for a member of the Hamelden family, of Holton St. Peter in Suffolk. This parish is on the outskirts of Halesworth, in an industrial estate where Bernard Matthews turkey products are made. 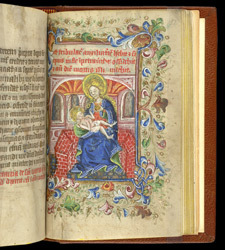 This image, fitted into the available space between a rubric and the litany, which starts at the top of the next page, may be based on a 'Hortus Conclusus' (Enclosed garden) composition, which often has the Virgin and Child seated in a sort of the three-sided wall; here, however they are clearly indoors, not in a garden.